2 Single Letter Holder with Ganpati. AttractiveAntique Ancient look. 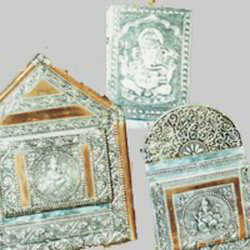 ExcellentQuality White Metal Embossed Sheet Mounted along with Decorative Copper Sheet onGood Quality Wooden & ply Frame. New LatestDesign gives ultimate look to your room. 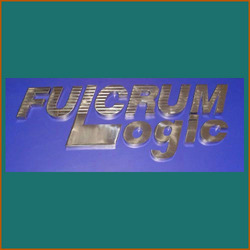 we are one of the prominent manufacturers, suppliers and exporters of steel box letters fulcrum logic. Made using high-grade steel, these are highly acclaimed for their dimensional accuracy, perfect finish, shine and durability. Steel box letters fulcrum logic provided by us are easy to install and ideal to be fixed on walls or gates. Color: Natural SS & PU Coated, as per requirement. We use quality certified components for delivering best range of Steel Box Letters. Veena & Neena Print Foils Pvt. Ltd.
We are offering a best quality array of LED Acrylic Box Letter to our esteemed customers. These products are made from high quality components. We are widely acclaimed in the market for offering various types of Signage (Steel Coated Box Letter). Preferred by architects, these signage can be availed in number of text, logos and motifs, as and when demanded by clients. We make use of acrylic, brass, stainless steel and aluminium material in the manufacturing process, so as to ensure delivery of a sturdily designed range. This LED Acrylic Box Letter Board is scartch-resistant and demands little maintenance. We provide premium quality Acrylic Box Letter Board to clients at extremely reasonable market prices. This box letter board is highly non corrosive and anti abrasive. It is also elegant.